Ever wonder what happens when we die? Of course, you have. It’s all part of the human experience. But, have you ever heard about people who’ve died, and then return with stories about seeing their body from above, while doctors frantically work to keep them alive? Some even claim to have seen a light at the end of a tunnel. Others, see relatives, friends and pets who have past, or luminescent figures waiting for them from beyond. These experiences, known as near-death experiences (or NDEs), have been well-documented by prominent researchers like Dr. Raymond Moody for years. But there has never been hard proof that the mind continues to work after the body has died — until now. The concept of consciousness after death is not a new theory; it’s an idea that’s been discussed for ages. But today mental health professionals, and even scientists and physicists, have joined the conversation. In fact, new research now suggests that when we die, we are fully aware we’re dead. The claim, made by Dr. Sam Parnia, director of critical care and resuscitation research at NYU Langone School of Medicine in New York City, is a result of Parnia and his team studying people who suffered cardiac arrest or technically died, but were later revived. The largest-ever study on death may sound frightening, but it brings us one step closer to discovering what actually happens after we die. The study suggests that people are aware they’re dead because their consciousness continues to work after the body has stopped showing signs of life. Parnia explains to the Independent, that a “sort-of” life after death is based on the very meaning of death itself, defined by cardiac arrest, or when the heart stops. But, according to Parnia, evidence now shows that there’s a burst of brain energy as someone dies. In fact, some of the people studied said they were aware of full conversations and seeing things that were going on around them — even after they were pronounced dead. Their accounts were then verified by the medical and nursing staff who were present at the time. But it’s not the first-time brain activity after death has been recorded. 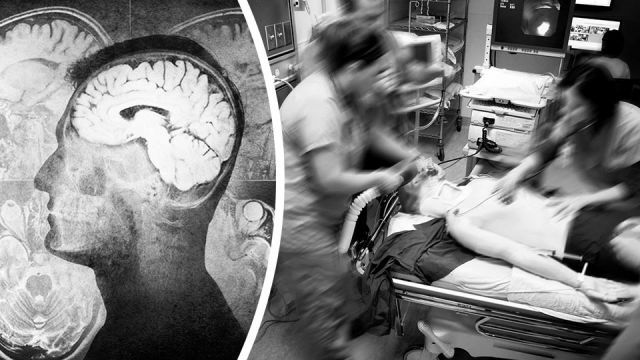 In March of this year, doctors at a Canadian intensive care unit discovered something strange. When life support was turned off for four terminal patients, one of them showed persistent brain activity even after they were declared clinically dead. For more than 10 minutes after doctors confirmed death — through various observations, including the absence of a pulse and nonreactive pupils — the patient appeared to experience the same kind of brain waves we have during deep sleep. Earlier this year Dr. Parnia appeared on The Dr. Oz Show. He discussed the science behind what happens when we die, and like many NDE researchers before him, he suggests that the act of dying — naturally but not by suicide — is a pleasant experience. “A lot of people are afraid of death because it’s the unknown,” Parnia tells the audience. “But what we actually know, is that when we die — [if we could] sort of jump into the person’s body at that time — that experience is not unpleasant.” So, even if we were in pain before we die, the process of death becomes very comfortable, blissful and peaceful. What happens after the initial feelings of peace, says Parnia, is that people often experience a bright white peaceful light that draws the person towards it. They describe the sensation of deceased relatives coming to greet them. And in many cases, those who have died describe a feeling of not wanting to return to their body. And if you think it all boils down to hallucinations, Parnia says “no.” It can’t be a hallucination, since the deceased often return, repeating to the doctors and nurses everything that has been spoken and done in the hospital or operating room. Previously deceased patients also speak of a review that seems to take place after death, whereby, they describe feeling all the hurt and pain they inflicted on others during their life. In fact, those who return from the dead are much more positive, suggests Parnia. They’ve been given a second chance, so life has more meaning. Interestingly, a common thread exists between those who have died and come back. First and foremost, it’s the sensation that they should have done more for others, spent more time with families — generally loved more and lived better. Basically, they wish they had lived a less self-centered life and instead had been more selfless. So, do you think life continues after death? This ageless question has haunted humans since the dawn of time. But now, because of advancements in science, more and more people who die are being resuscitated or brought back to life to tell their story. It’s for this reason, information on life after death is becoming more available. Maybe now, with science actively studying death and dying, we’ll get closer to answering that life-altering question. Hey Buddy!, I found this information for you: "This Is What Happens To Your Brain After You Die". Here is the website link: https://www.thealternativedaily.com/has-science-discovered-life-after-death-what-happens-to-your-brain-after-you-die/. Thank you.